The final countdown to Thanksgiving has begun. At this time, each year, I have second thoughts about the amount of food that will be served. I think: Surely it won’t be enough. Well, it always is enough (a magical principle of Thanksgiving) – but some hostess preservation instinct kicks in, worrying that there won’t be an abundance of food befitting a Thanksgiving table lined with guests. So I devise a few last minute recipes to round out the menu with little effort. Often that includes a salad. For all of the traditional Thanksgiving preparations, a bright and robust seasonal salad is often overlooked. Cooked vegetables, stuffings and mashes are the tradition, but do not underestimate a bowl of fresh seasonal greens, nuts and fruit. Not only is it light, fresh and palate cleansing, it’s autumnal hues of ochre, magenta, and forest green, speckled with glistening seeds, nuts and fruit, transforms it into a side dish pretty enough to be a centerpiece. In a bold salad like this, it’s important to have a balance of flavors. Bitter radicchio is matched with salty prosciutto and sweet squash finished with a rich, sweet-sharp balsamic vinaigrette. Feel free to tinker with the ingredients. The prosciutto may be substituted with crisp rendered bacon or pancetta. Dried cranberries or figs may be substituted for the pomegranate seeds. Pecans or almonds may be used in place of the walnuts. Let your pantry decide! Heat oven to 350 F. Arrange prosciutto on a baking sheet. Bake in oven until firm and crisp, 20 minutes. Remove and cool. Break into shards and set aside. (Alternatively, pan-fry 6 ounces (170 g) thick sliced bacon, cut in 1/2-inch pieces or pancetta cubes until fat renders and crisp. Drain on a plate lined with a paper towel). Peel the butternut squash. Slice in 1/2-inch planks. Cut each plank in 1 1/2-inch squares. Season with salt, pepper and a pinch of cayenne (optional). Heat 1 tablespoon olive oil in a skillet over medium heat (if using bacon or pancetta, discard all but 1 tablespoon rendered fat from skillet). Place squash in the skillet. Cook until golden brown on each side, turning once. Remove from heat and set aside. Prepare vinaigrette: Heat oil and garlic in a small saucepan over medium heat until warm and garlic begins to turn golden brown. Remove from heat and discard garlic. Carefully add balsamic vinegar, sugar, salt and pepper to the oil. Return to cooktop and warm over low heat, whisking constantly until emulsified. 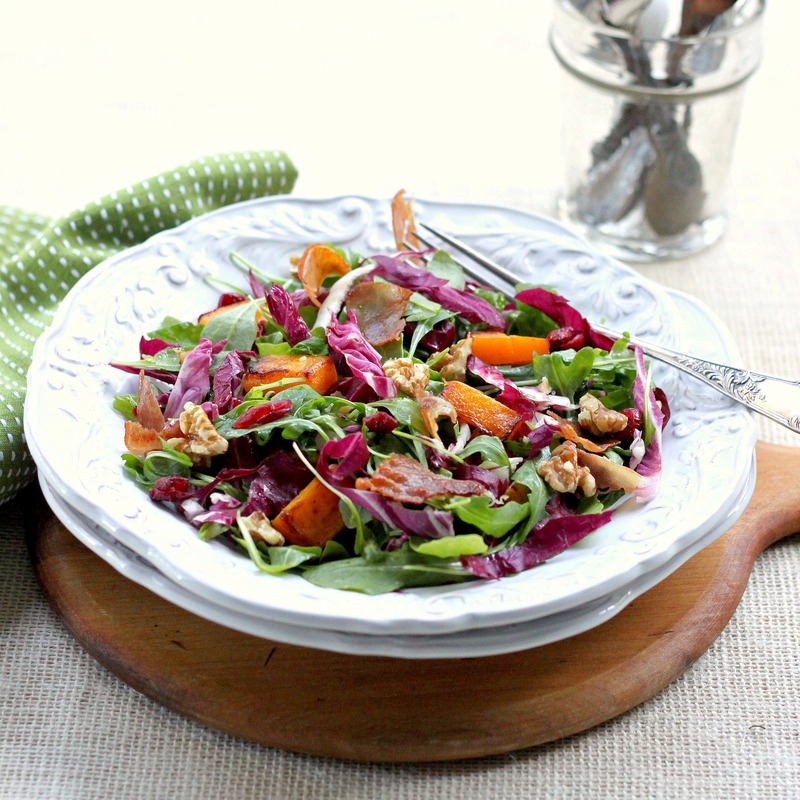 Assemble salad: Toss arugula and radicchio in a large bowl. Scatter squash, pecans and pomegranate seeds over the salad. Drizzle with half of the dressing. Toss to combine. Add more dressing to taste. Another winner of a recipe! I like everything about it, so this one goes straight to my Pinterest! Thanks, Sally – Happy Thanksgiving to you, too! A beautiful salad! So colorful and mouthwatering. Thank you, Alicia! And a Happy Thanksgiving to you, too! I, too, like to have a seasonal salad to add that other taste and texture to Thanksgiving dinners. This is an excellent combination of flavors.. and I love that the dressing is served warm! Happy Thanksgiving! This salad is just gorgeous. I love the warm vinaigrette – something I’ve been meaning to play around with. I chuckled (just a little) at your hostess preservation instinct; I’m sure your spread will be glorious! Happy Thanksgiving! A hearty and seasonal salad will be on the agenda this weekend. After the Thanksgiving indulgence this is what we will crave! An excellent recipe! Salads are a great idea to plump up any menu, especially when the meal involves a lot of meat. This sounds lovely! Love the idea of the warm vinaigrette here….yummy.